Recombinant full length protein corresponding to Human TNFSF18/GITRL. Purified. Protein previously known as TNFSF18. Our Abpromise guarantee covers the use of ab25948 in the following tested applications. WB Use a concentration of 1 µg/ml. Detects a band of approximately 25 kDa (predicted molecular weight: 20 kDa). Cytokine that binds to TNFRSF18/AITR/GITR. Important for interactions between activated T-lymphocytes and endothelial cells and may modulate T-lymphocyte survival in peripheral tissues. Expressed at high levels in the small intestine, ovary, testis, kidney and endothelial cells. 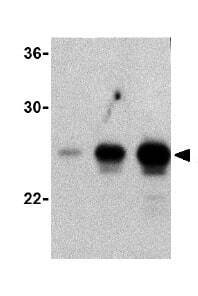 ab25948 at 10 µg/ml staining TNFSF18/GITRL in THP-1 cells by ICC/IF. ab25948 has not yet been referenced specifically in any publications. Publishing research using ab25948? Please let us know so that we can cite the reference in this datasheet. There are currently no Customer reviews or Questions for ab25948.